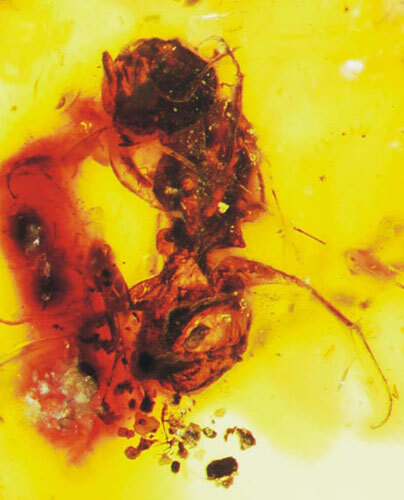 A bee in amber from southeast amber, which is over 100 million years old. That is really hard to wrap your head around. Even the first cave drawing from neolithic spain showing a person harvesting honey date to 13,000BC, a mere 15,000 years ago. But 100 million years ago…I don’t know how to begin to connect with that time. During this time, dinosaurs were still living and in fact, tyrannosaurus and triceratops hadn’t evolved yet. Arachnids, reptiles, fish, amphibians and birds are already around, but it was only 30 million years after angiosperms evolved that bees came around. Interesting to note that shortly after bees, came snakes. While there were other insects around before bees, ants didn’t show up until a good 20 million years later than bees. Primates don’t appear in the history of the earth until a good 40 million years later, although mammals appeared before the honey bee. At our present point in time, honey bees have had a relationship with flowers for 100 million years. The longest relationship honey bees could have with anatomically modern humans, is only 200 thousand years, though known evidence shows about 15 thousand years. Is it any wonder that honey bees seem to be so joyful when they dance upon and collect food and medicines from the flowers they have coevolved with for the past 100 million years? At the same time, the flowers receive buzzing pollination from the very dance partners they’ve chosen. I can think of many benefits that the bees provide to us humans, but what do we provide for them? If we want to continue to have a relationship with honey bees and continue the dance, we need to be a strong dance partner and provide back to our beautiful, fuzzy partners. I find it most beneficial to let the honey bees lead, but to be a good dance partner, you have to be able to sense your partners’ non-verbal cues and respond quickly. That, is why I sit and listen to my bees. I sit and watch. What do my senses tell me and what feelings come to my being? What are the bees trying to tell me, if I only take the time to listen and be a good dance partner.